August 18 marks the 100th birthday of legendary Augsburg College coach Edor Nelson ’38. Nelson is one of the elite Augsburg coaches who profoundly impacted the College’s athletic programs and whose influence echoed in the lives of student-athletes beyond their competitions on athletic fields, rinks, and courts. 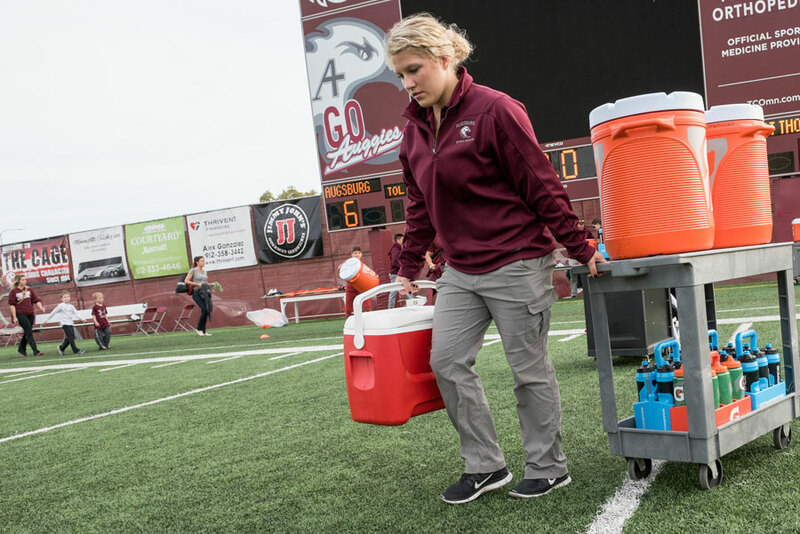 At Augsburg, the legacies of renowned coaching staff and faculty live on in the facilities that carry their names, are exhibited in their own philanthropy, and can be seen in the generosity they inspire in others. Bruce Nelson ’71, son of Edor Nelson, said coaches such as his father grew up in an era in which sacrifice for the greater good was common, and coaches played larger roles in the lives of student-athletes than simply running drills. 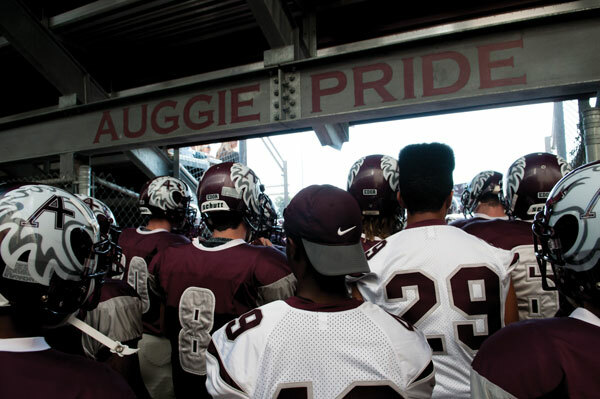 “These coaches taught student-athletes about commitment and that a team is bigger than the individuals,” said Bruce, who lives out what he learned—in part—by serving as president of the Augsburg A-Club, a service organization of former and current Auggie student-athletes and friends of the College. Bruce knows from first-hand experience that student-athletes see, understand, and appreciate the ways their mentors continue to influence their lives as they move on to new opportunities. Ernie Anderson ’37–Coach of Augsburg’s men’s basketball team from 1947-1970, Anderson also was athletic director for 33 years from 1947-1980. His tenure inspired the Ernie Anderson Court in Si Melby Hall. Marilyn Pearson Florian ’76–Coach of Augsburg’s women’s volleyball team from 1981-1998, she also was the women’s athletic director from 1988-2007. She increased the number of women’s sports and of female student-athletes. Edor Nelson ’38–An Augsburg Athletic Hall of Fame member, Nelson coached football from 1947-1969 and baseball from 1946-1979. Augburg’s outdoor athletic field bears his name. Lavonne Johnson Peterson ’50–“Mrs. Pete” led the ‘Auggiettes’ basketball team in 13 unbeaten seasons from the 1950s to the 1970s and was an instructor until 1980. Augsburg named the health and physical education center in her honor. Joyce Anderson Pfaff ’65–A pioneer in women’s athletics and in the establishment of varsity women’s sports, Pfaff was Augsburg’s first women’s athletic director, serving from 1972-1998. She also taught for 43 years. Ed Saugestad ’59–Coach of the men’s hockey team from 1958-1996, Saugestad’s championship teams claimed three NAIA national and six MIAC state titles. One of Augsburg’s hockey rinks is named in honor of Saugestad, who passed away in March. Jeff Swenson ’79–Wrestling team coach for 25 years, Swenson has served the past 10 years as athletic director. Auggies brought home 10 national wrestling titles under his leadership, and the wrestling wall of fame bears his name. Today the commitment of these coaches continues to be honored through philanthropic initiatives by alumni whom they inspired. Corky Hall ’71, Augsburg’s first men’s hockey All-American, is challenging fellow student-athletes-turned-Augsburg-alumni to raise funds for a named space in the Center for Science, Business, and Religion (CSBR) to honor Saugestad. Mark Rabbe ’53, one of Edor Nelson’s baseball players, is funding a faculty office in the CSBR to honor the coach. And additional challenges are underway to honor the centennial of Edor Nelson’s birth. 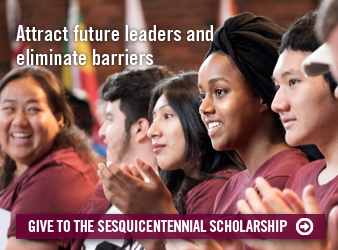 These Augsburg alumni—and many others who have stepped up to join a philanthropic challenge—demonstrate that alumni athletes recognize the role coaches played in positively shaping their lives and are willing to seize the opportunity to make a positive impact on the Auggies of tomorrow.